Discover the magic of the Mackerel Islands. Escape to the Mackerel Islands for a holiday full of adventure and relaxation, just a 2-hour flight or 1,400km drive north of Perth. A collection of ten pristine islands and atolls scattered off the mid-coast of Western Australia, 22km from the mainland of Onslow, the Mackerel Islands welcome guests to two of these - Thevenard Island and Direction Island - with accommodation, facilities, activities and tours. Stay in a choice of beachfront cabins with stunning ocean views, or for the ultimate wilderness escape, rent your own island with a sole beach shack. Spot sea turtles, whales and dolphins, snorkel among colourful fish, jump on a kayak or SUP board, hire a boat and cruise around the bay, stargaze in awe while soaking up the quietness, or join our skipper on one of our sensational fishing charters. This is the amazing, off the beaten track experience you’ve been looking for. The Mackerel Islands and Onslow are easy to access via Perth, Exmouth, Karratha or Broome. Options for getting here include travelling by road, air or boat. From Onslow, the Mackerel Islands are a short 45 minute ferry transfer across. Perth to Onslow is a comfortable drive of about 1.5 days on fully sealed roads. Onslow sits almost right in the middle of Exmouth and Karratha, being a 4 hour drive north from Exmouth or 3 hour drive south from Karratha. Onslow Road runs about 80km off the North West Coastal Highway, which connects the main towns of Geraldton, Carnarvon, Exmouth, Karratha and Port Hedland, or off the Great Northern Highway which connects from Broome. If you’re adventuring through the stunning Karijini National Park, the Nanutarra Munjina Road will connect you with the N W Coastal Highway then Onslow Road, and takes approximately 5 hours drive time. Virgin Australia flies daily from Perth to Onslow, making it a short 2 hour hop from Perth and the easiest way to get here. Qantas flies daily between Perth and Exmouth (Learmonth) or Perth and Karratha. Pick up a hire car for a mini road trip to Onslow. Thevenard Island has a 1,000m brick paved airstrip. Should you require further information on airstrip access, please contact us. Transfers to the Mackerel Islands depart 4 times per week (subject to weather conditions) from our private jetty in Onslow, bookings are essential. Bring your own boat and hire a mooring. 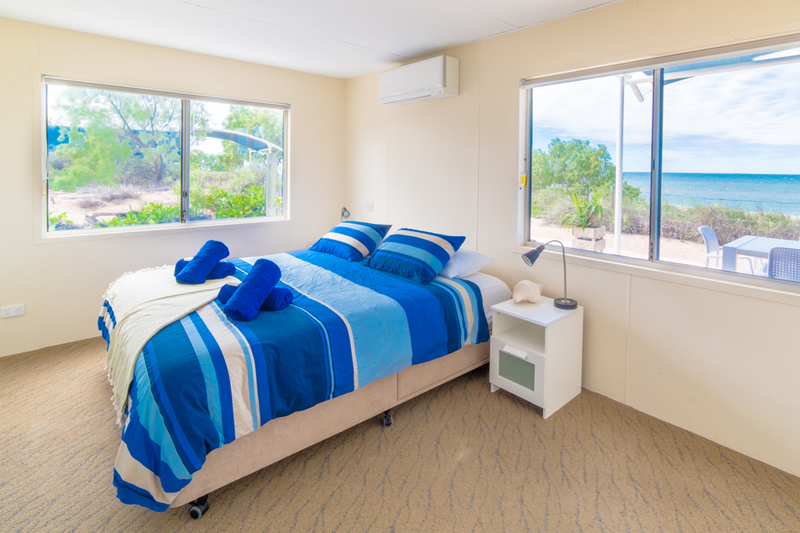 2 Bedroom Beachfront Cabin sleeps 1-4 people. Bedding is 2 zip kings or twin beds. Rate includes up to 4 people. Spaced along the beach overlooking the boat moorings and swimming bay, the Thevenard Beachfront Cabins are all completely self-contained and designed for relaxation. 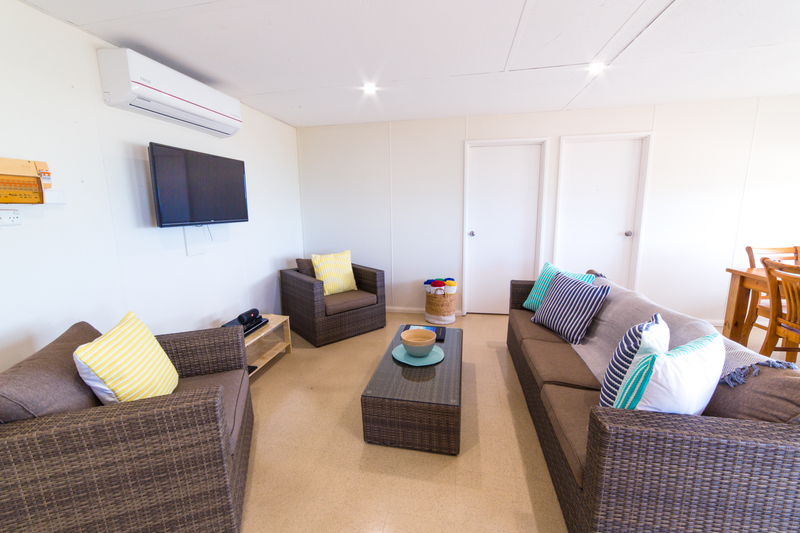 Each cabin features a fully-equipped kitchen (including fridge, stove top, oven, microwave, toaster, kettle and coffee pod machine), lounge and dining areas, private bathroom with additional second toilet, air-conditioning, flat screen TV and shaded outdoor entertaining area with a Weber BBQ. There is a complimentary tea and coffee welcome pack included. 3 Bedroom Beachfront Cabin sleeps 1-6 people. Bedding is 3 zip kings or twin beds. Rate includes up to 6 people. Spaced along the beach overlooking the boat moorings and swimming bay, the Thevenard Beachfront Cabins are all completely self-contained and designed for relaxation. 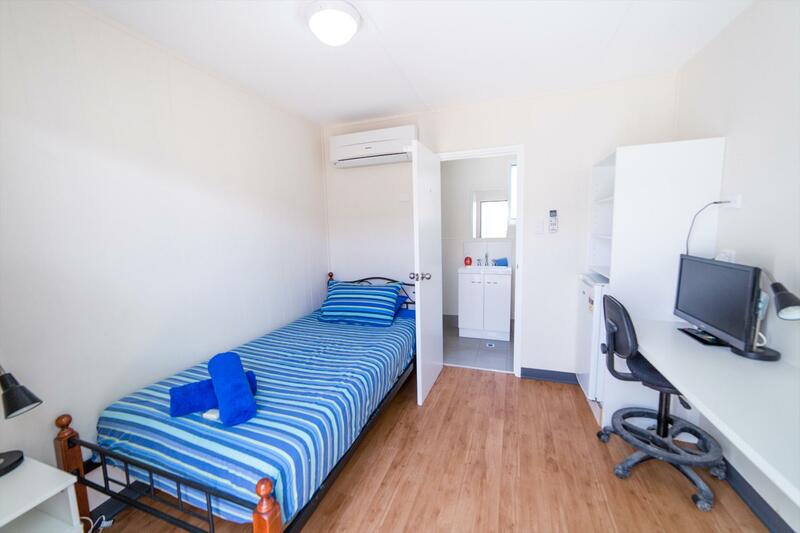 Each cabin features a fully-equipped kitchen (including fridge, stove top, oven, microwave, toaster, kettle and coffee pod machine), lounge and dining areas, private bathrooms, air-conditioning, flat screen TV and shaded outdoor entertaining area with a Weber BBQ. There is a complimentary tea and coffee welcome pack included. 5 Bedroom Beachfront Cabin sleeps 1-10 people. Bedding is 5 zip kings or twin beds. Rate includes up to 10 people. Club Thev Double Room sleeps 1-2 people. Bedding is 1 double bed. Rate includes up to 2 people. Club Thev is a great option if you�re a thrifty traveller, require a larger group booking, or are seeking a social environment to connect with others. 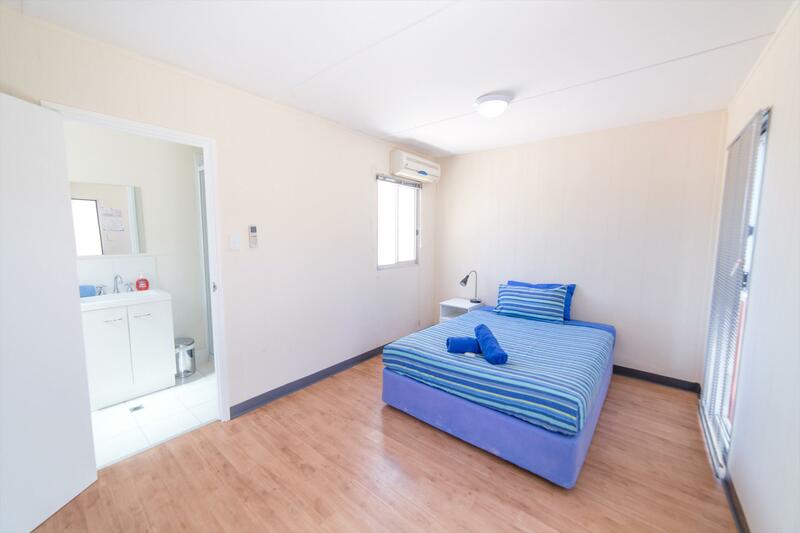 Each room features a private ensuite bathroom, air-conditioning/heating, flat screen TV, desk and mini-fridge. There is a central swimming pool, BBQ area, games room and traditional �club bar� to enjoy. Club Thev Single Room sleeps 1 person. Bedding is 1 single bed. Rate includes up to 1 person. Direction Island 2 Bedroom Beach Shack sleeps 1-8 people. Bedding is 2 queen beds and 2 bunk beds. Rate includes up to 2 people. Extra person rate is $60 per additional person. Direction Island offers a unique and distinctly Western Australian island experience. 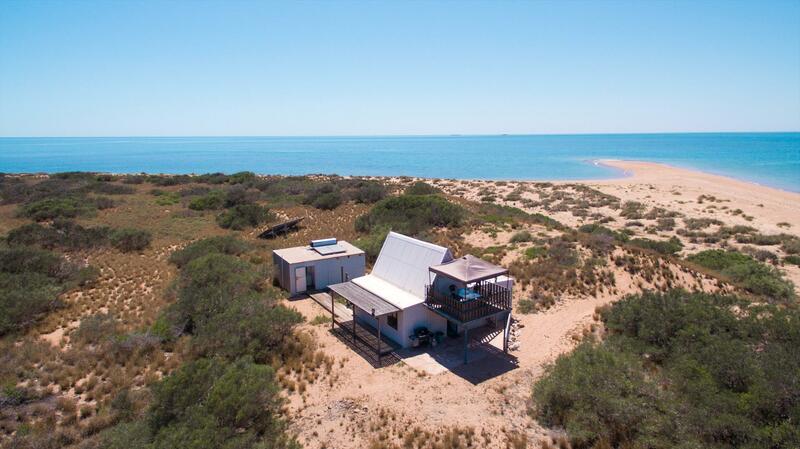 Located 11 kilometres off WA�s stunning Pilbara coast and nestled within its own coral reef among the spectacular waters of the Mackerel Islands, you can play castaway with up to 8 people on this rustic little island gem. 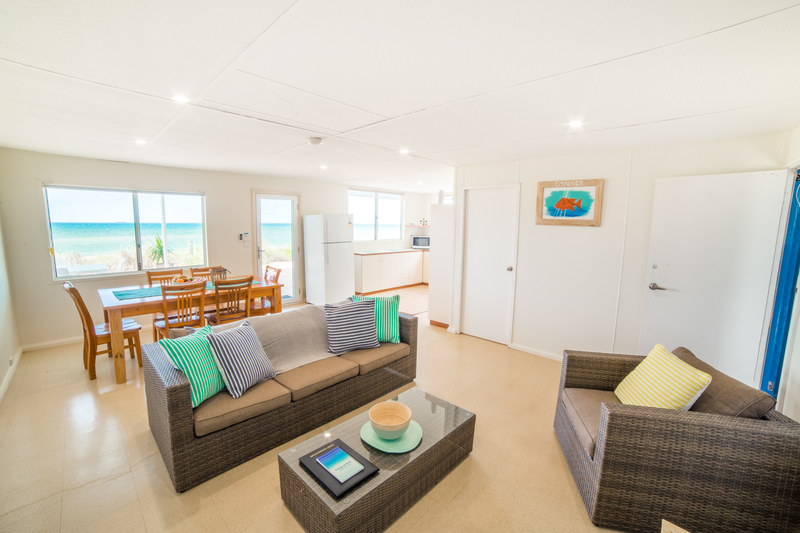 Although the sole beach shack isn�t air-conditioned it is well ventilated, has ceiling fans in each of the rooms and all the home comforts you need to experience having an island all to yourself. There is a fully-equipped kitchen (including fridge, deep freezer, stove top, oven, microwave, toaster and kettle), dining areas, private bathroom, shaded outdoor entertaining area with a Weber BBQ and an upstairs balcony deck with ocean views. The shack is not serviced so is self-clean and cleaning supplies are provided. A 25% deposit is required to confirm all bookings. The full balance is due 28 days prior to arrival. Bookings must be cancelled at least 28 days prior to arrival date to receive a full refund less 10% administration fee of monies paid. Cancellations made inside the 28 day period will not be issued with a refund. All no shows will be charged full payment. Group bookings (10 or more rooms) must be cancelled at least 28 days prior to arrival date to receive a full refund less 10% administration fee of monies paid. Cancellations made inside the 28 day period will not be issued with a refund.